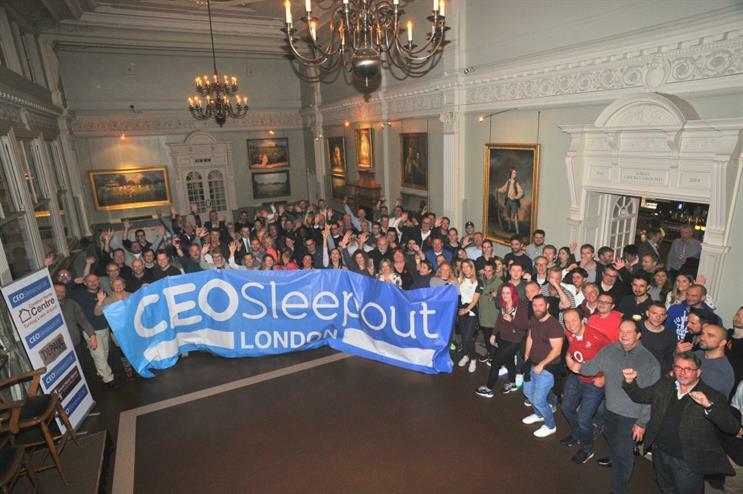 Lord's Cricket Ground played host to the biggest ever CEO Sleepout event raising £180,000 for the homeless charity. Held on Monday (31 October) more than 200 top business leaders slept outside to raise money and awareness for homelessness. It was also attended by celebrities from the sporting world and a number of MPs. The evening began with a reception and Q&A session held in the Long Room with former England Captains, Mike Gatting and Mike Brearley. Many sleepers then enjoyed a coaching session with the Marylebone Cricket Club (MCC) Cricket Academy before bedding down for the night with various sleeping bags and layers of warm clothing in the Mound Stand. Former Arsenal, Tottenham and England defender Sol Campbell and his wife Fiona Barratt-Campbell slept out alongside a 12-strong team from Fiona Barratt Interiors to raise money for their local charity the Cardinal Hume Centre. Parliamentarians among the sleepers included London Conservative MPs David Burrowes and Stephen Hammond, and Conservative MP David Mackintosh who chairs the All Party Parliamentary Group for Ending Homelessness. Representatives from the owners of the cricket ground MCC, along with England & Wales Cricket Board (ECB) chief executive, Tom Harrison and ECB director of England women’s cricket, Clare Connor also spent the night at the ground. The funds raised from the event benefitted a number of homelessness charities including CEO Sleepout UK, Depaul, the Cardinal Hume Centre and YMCA North London.